Mark and his buddies make them all the time when they go on their fishing trips. I asked the guys if I could use their recipe and modified it based on what I had in the house. Let’s start with the first step. Shuck the clams. Technically you need a clam knife to do this. If you’re not sure how, this nifty video tutorial will come in handy. I use a butter knife and if I have a really stubborn clam that just won’t open, I pop it into the microwave for about 15 seconds OR you can have someone else shuck them. 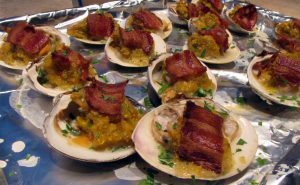 Use littleneck clams for this dish. While you’re opening up the clams, preheat your oven to 425F and bake 4 slices of Jones Dairy Farm Hickory Smoked Dry Aged Bacon on a rimmed cookie sheet for 8 minutes. Place the bacon on some paper towels and reserve the drippings. Bacon! Perfectly, partially cooked. Mark snagged half a piece before I could take a picture *sigh*. Make the topping. This part is easy if you have a food processor. I highly recommend using a food processor to make the topping unless you can chop everything up really, really small. The topping is full of veggies and flavor with just enough bread crumbs to bring everything together. I used scallion, celery, carrot, butter, bacon drippings, roasted red pepper, some herbs and lemon juice. Pulse till combined, but still with some texture. Okay, I started off with 18 clams. I ate one. The recipe makes enough for a dozen and a half. 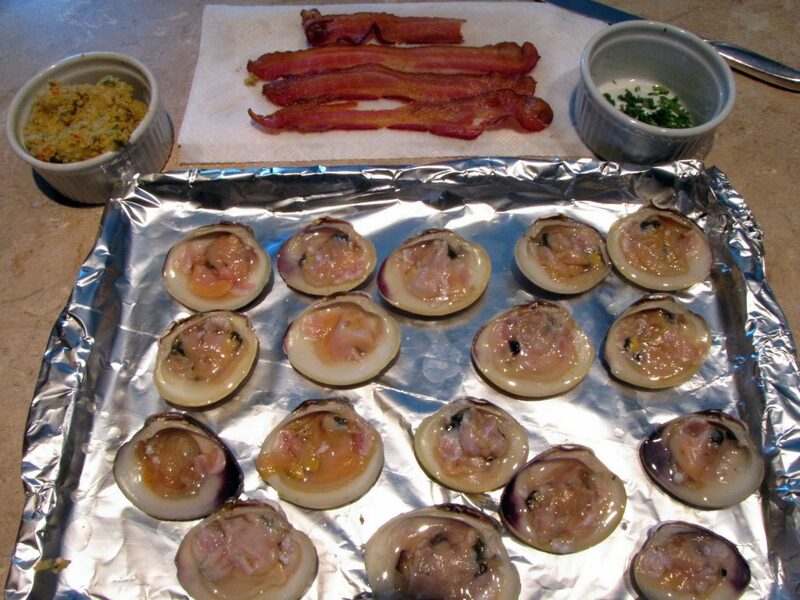 These are all the ingredients – clams, topping, bacon and parsley for garnishing after baking. Oh, and that’s my ‘clam knife’ behind the parsley. Next top the clams with some of the topping. You’ll have to eyeball this part. Reduce the oven from 425F to 375F. Place bacon on top of the filling. Carefully slice the bacon into 1″ strips. Place a piece on top of the filling. Eat what’s left over. Bake. This part is pretty self explanatory. 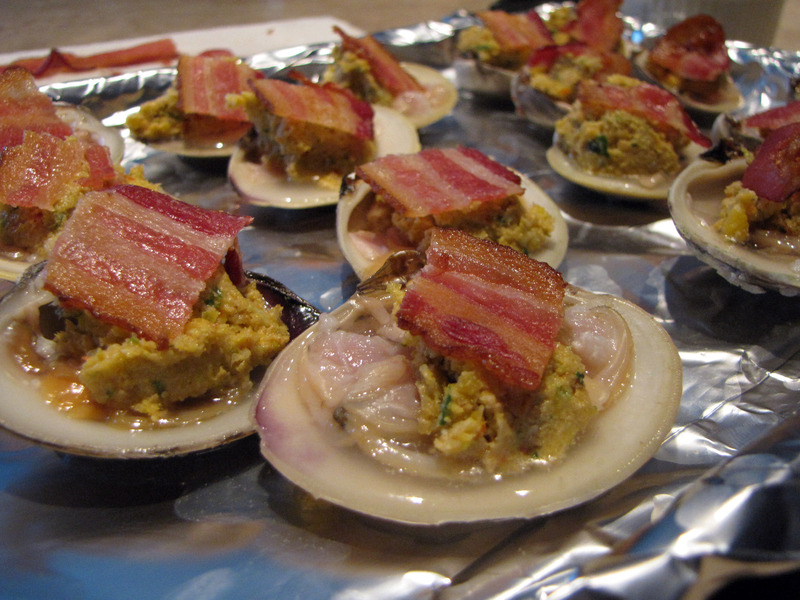 Bake for 10-15 minutes until the clams are cooked and the bacon is nice and crisp. Sprinkle fresh parsley on top and prepare to dig in. Eat. I ate the first one straight away without lemon juice. The rest I ate with a little freshly squeezed lemon juice on top. Yup, just that little bit of lemon juice made all the difference. Yum! I’ve included the recipe in its entirety below. 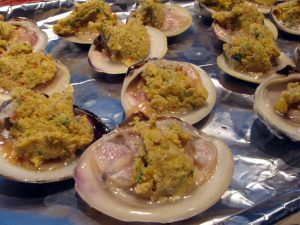 I know that this might seem a little time consuming but Clams Casino are well worth the effort. You can easily double or triple this recipe. I would recommend allowing 4-6 per person if you’re serving as an appetizer. Disclosure: Jones Dairy Farm provided the bacon for this recipe and they do compensate me for developing recipes. You can use their nifty store locator to find their products in your area. To celebrate the 125th anniversary of this family-owned business, Jones Dairy Farm has published this FREE cookbook. Check it out! Preheat oven to 425F. 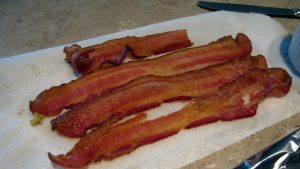 Place the bacon on a rimmed baking sheet. Cook for 8-10 minutes. The bacon should be partially cooked but not crispy. Drain on paper towels. Reserve the bacon drippings. While the bacon is cooking, shuck the clams making sure that each clam has a bit of juice in its half of the shell. Place the clams on a rimmed baking sheet. Make the topping by placing the rest of the ingredients, except the parsley, in a food processor. Process until well combined, but still with a little texture. Top each clam with topping. Top the topping with a 1" piece of bacon. Bake at 375F for 10-15 minutes. Bacon will be nice and crisp and the clams will be done.